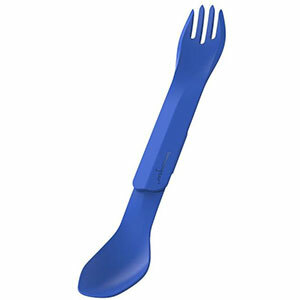 A convenient item if you use both a spoon and a fork, and prefer longer tines than a spork. Sturdy construction, length, and versatility make it worth considering, but also pay attention to the spoon depth, need to switch ends during a meal, difficulty cleaning, and potential for discoloration. I used the Humangear GoBites Duo (hereafter referred to as Duo) from September 2016 through August 2017 on at least 10 backpacking trips. It was my primary utensil from September to March and a backup or alternate on several trips with my wife since then. I have eaten somewhere between 40 and 50 meals with the Duo. Most meals were typical backpacking food: breakfast included granola with fruit, grits, or oatmeal while most dinners were pasta and barley based soups and stews or pre-packaged meals like chili or chicken and dumplings. 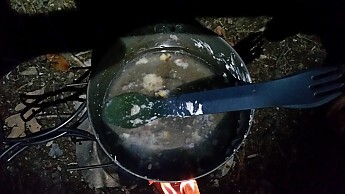 Several of the dinners had medium sized pieces of pasta or meat to test out the ability to hold food in the spoon, and some needed some “stabbing” with a fork. No cutting was attempted with the Duo beyond typical breaking of pieces as you would with any spoon or fork. 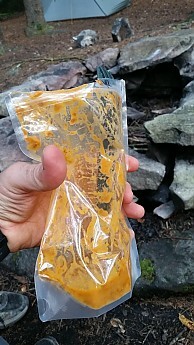 We mostly eat from bowls when hiking together, and I eat directly from a 1.3 liter pot when solo hiking. A couple of meals were eaten directly from a boil-in-the-bag type Ziploc to test that popular option. 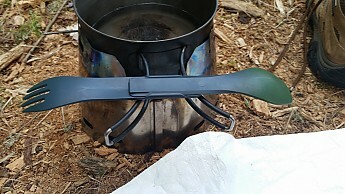 I generally carry only a spoon and a folding pocket knife for eating and camp chores. 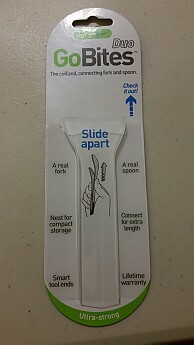 I have been using the same Lexan spoon since the early '90s and therefore was reluctant to switch, but felt like I should give a new utensil a try and possibly carry two for longer trip backup…just because I haven’t lost one in a quarter century doesn’t mean I won’t! 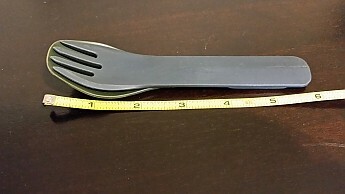 Therefore, I have been carrying several different utensils for the last year to try out (Light My Fire plastic sporks and Vargo Titanium Folding Spork). of course you can always use just one of the items (spoon or fork) without locking them together if you want. The Duo comes in a simple package (always appreciated) of cardboard. It weighs 0.8 ounces (mfg spec is 0.78) and measures 9.5 inches when open and 5.75 when stored. Gram counters will note that this is twice the weight of some simple utensils, but I really don’t consider this little weight a significant issue. The Duo is made of high-temp BPA-, PC-, and phthalate-free food grade nylon. 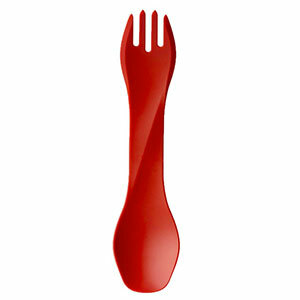 The fork edge is designed to cut soft food, and low-curvature spoon edge for scraping the sides of containers. It is dishwasher safe. The nylon construction seems to be extremely rugged. Unlike several Light My Fire sporks that I have managed to snap, the Duo never worried me at all even when flexing it a bit to fit it into my pot. While I believe the specs that state it is food-grade and BPA/PC/phthalate free, I was concerned that immersing it in boiling water has permanently changed the color of the spoon (difficult to see but visible in the photo below). While the specs suggest this does not mean chemicals leached into my food, I do wonder why this happened…aesthetics don’t matter to me but chemical changes in the material do. The pieces lock together with a satisfying click that lets you know it is locked. 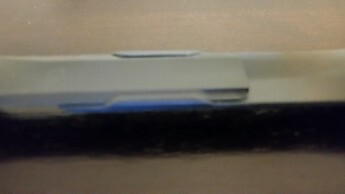 The slide lock grooves and catch show no signs of wear after six months, and I never had it come apart on me while eating. The Duo is extremely easy to use and has no instructions. The locking mechanism is simple to work out but make sure you hear the click. I had no problem assembling or disassembling it. 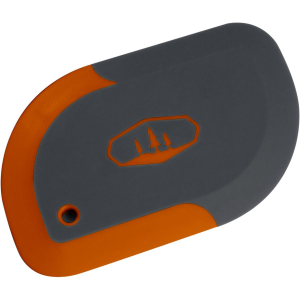 The grooves of the locking mechanism can get gunked up with food especially when eating out of a bag, and take a little bit of cleaning to make sure nothing gets caught. 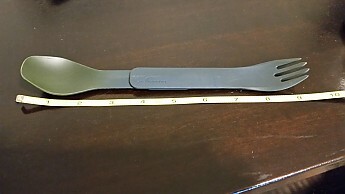 The 5.75 inch length for storage is decent, but larger than my other alternative (Vargo Titanium Folding Spork) and old lexan spoon (that I cut down to my pot size). 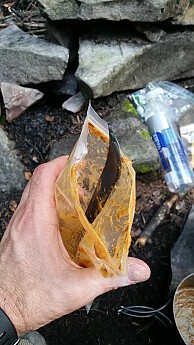 The 9.5 inch extended length is more than adequate for typical back country eating, and sufficient to reach the bottom of the few boil in the bag meals I ate as shown below, although there isn’t a lot of clearance above the bag without folding it down. As a spoon, the Duo functions adequately. The depth is enough to eat most meals. 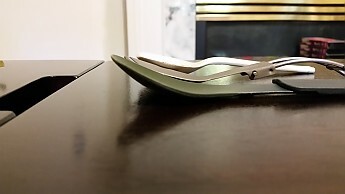 Here is a side view of the Duo alongside my old reliable Lexan spoon and my recently reviewed Vargo Titanium Folding Spork. You can see the best depth is in the old spoon and the other two are close to equal although the Duo is longer and therefore the volume is closer to the Lexan spoon. 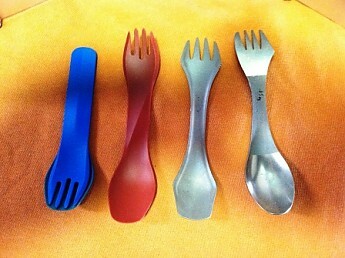 As a fork, it functions better than a spork, although I haven’t compared it to other backpacking forks. This comes from someone who has used only a spoon for almost 30 years, so if you are picky about your fork function you may want to compare others. I had no trouble at all spearing food with the fork and feel that it would hold its own against other options. The cutting edge worked fine for all the food I used it on—noodles and softer meats. For those who like to eat their meals out of a bag, the Duo seems adequate. Although I generally don’t eat out of the bag, I did try this for testing purposes a couple of times. I did get some food on my knuckles scraping the bottom of the bag of a couple of Packit Gourmet meals. 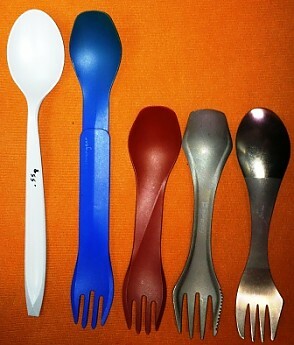 The length (9.5 inches) is equal or slightly longer than several long-handled spoons on the market. The main flaw in the Duo for me is when you have a meal that needs both a spoon and a fork. This is where a spork, in my opinion, outshines the Duo. For these meals you have to switch ends, which can get a little messy unless you carefully handle each end and lick it clean prior to switching. 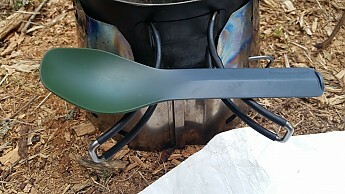 The relatively flat spoon end was really useful in scraping my pot clean, in fact it is probably my favorite feature of the Duo, as I “created” a similar flat end on my old lexan spoon over the years. 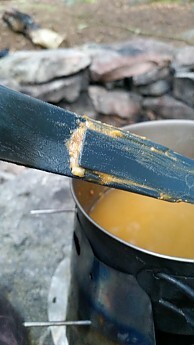 However it was this function (scraping a pot clean in boiling water) that caused the discoloration I mentioned above. It is difficult to think of a meal or cooking style that the Duo couldn’t adapt to. 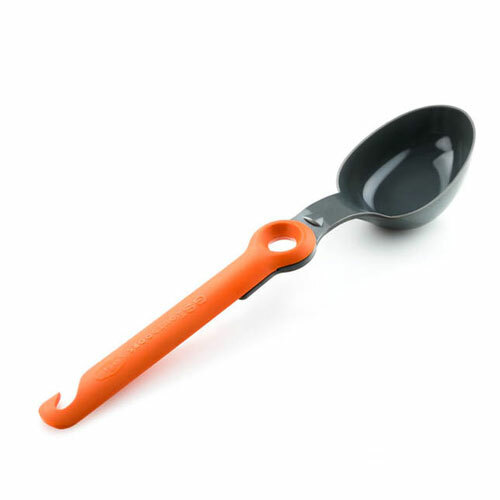 With a full spoon and fork function, the ability to be used individually or as a long-handled spoon or fork, pretty much any scenario is covered. I would recommend the Duo to boil in the bag folks who don’t like sporks or committing to just a spoon. 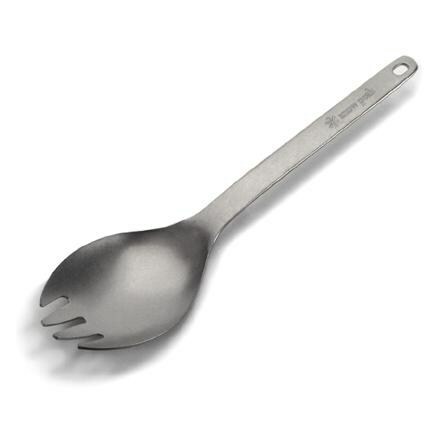 However, the increased difficulty cleaning, discoloration, and need to switch back and forth have reduced its usefulness for my cook in the pot dinners and I have reverted to a spork. Great review, Flip. Too short for me. I like my long spoon. Great review, Phil! Thanks for taking the time to share it and your pictures. But I can't believe you didn't dock it for not coming with an instruction manual...how does one learn to use a utensil otherwise? GoBites Duo — One spork to rule them all. Ok, maybe just very well thought out, giving it a wide range of capability. Last winter, my job had me traveling near Paramus, N.J. That meant I had to visit the "Mecca" of my youth. Campmor. Wandering around looking at things I couldn't find locally in Iowa, I ran across the GoBites Duo. $7, OK, why not. 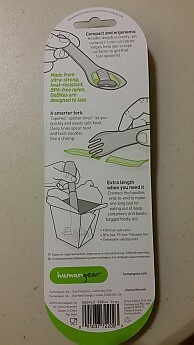 I have to say, this utensil set is durable, fairly compact and yet can get to the length needed to reach down into a bag of freeze dried food with ease. 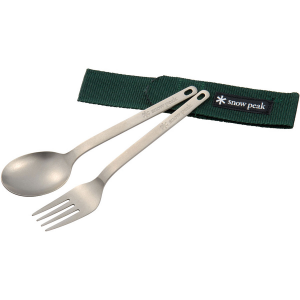 Yes, some would consider them heavy at 23g, but when you compare it to the titanium LMF spork at 19g and the Fire Maple Titanium spork, at 23g in the photo above, the flexibility of the Duo shines through. Plus, they are almost half the cost. Try to get those other two to the bottom of a Mountain House bag. The quality of the build on these units also in my opinion negates the value of the titanium. These GoBite units (The Uno in red - 15g) are rock solid. The humangear GoBites Duo is not available from the stores we monitor.